Snack Girl loves finding new websites that encourage eating healthy as a mode to lose weight. Martha writes Simple Nourished Living and is a great source for healthy, easy, and delicious slow cooker recipes (with Weight Watchers points calculated). I am excited to finally get a chance to feature her. I'd like to thank Lisa for the opportunity to share one of my favorite easy recipes with you today. I'm a big fan of Lisa and her Snack Girl website. Previewing Snack Girl to the Rescue! helped me realize just how in alignment our philosophies around healthy eating and weight loss are. My weight struggles began in childhood. It's taken me a long time to find my perfect recipe for living happy healthy and slim. After decades of struggle, it finally began to fall into place for me, as it did for Lisa, when I took the emphasis off losing weight and put it on paying attention to what I was eating and getting healthier. Managing your weight and your health is a lot like managing your finances. To avoid being overweight you need to learn to live within your means. I can only eat so much food a day and maintain my weight. I try to make at least 80% of what I eat nourishing and tasty. The remaining 20% can be used however I want. And what I usually want is wine, dark chocolate and really good bread! Like Snack Girl, I believe in a life of healthy moderation free of extremes. When it comes to changing behavior slow and steady wins the race. It takes time, patience, practice, persistence and compassion to build healthy habits. I'm a lifetime member of Weight Watchers who has been comfortably maintaining my weight for the past several years. Simple Nourished Living is where I explore how I work to balance my love of food and desire to be happy healthy and slim. I love to eat and I like to cook but I'm extremely lazy at my core. So my goal is to make healthy cooking as easy and effortless as possible while not compromising flavor. I'm a huge fan of the slow cooker. I've discovered that by investing a little time in the morning, I can avoid stressing about what to cook for dinner later in the day. This 3-Ingredient slow cooker salsa verde beef is great example of that. It provides maximum reward for minimal effort. You can use it to make tasty tacos, burritos, enchiladas, quesadillas or your own taco salads or burrito bowls. Healthy food ready and waiting in the slow cooker is like money in the bank! Place roast in the slow cooker. Sprinkle taco seasoning packet all over the roast. Pour the salsa over the beef. Cover and cook on low 6 to 8 hours or until beef is very tender and pulls apart easily with a fork. Remove beef from slow cooker. Drain the liquid from the slow cooker and set it aside. Shred the beef by cutting it into chunks and then pulling it apart with two forks. 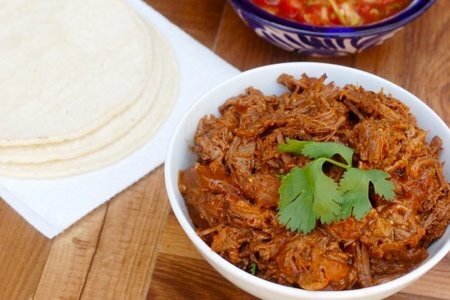 Discard any fat and place the shredded beef back into slow cooker. Pour ½-1 cup of the liquid back into shredded beef. Reduce setting to warm until ready to serve. PointsPlus® calculated by Simple Nourished Living; Not endorsed by Weight Watchers International, Inc.
Looks yummy! I bet it would be good with pork too - like pork carnitas. I'm thinking that this is WW "simply filling" if you use whole wheat tortillas! I thought you were referring to 'the Martha' as in Stewart. However, I checked out her website and it looks as interesting as yours. Thanks Snack Girl. Looks really tasty... I'm going to have to bookmark this one for a later date. Thanks so much!! Thank you Lisa and Martha. I have found some wonderful healthy eating websites at Snack-Girl; I will add Simple Nourished Living to my list! Well, I have some concern about an ingredient in the taco seasoning. I checked one manufacturer and found this additive "ethoxyquin (preservative)". This additive was first developed by Monsanto in the 50's and used as a pesticide and stabilizer. Not only has it been used in food for humans, it is commonly used in dog foods. Lab results on mice have determined liver and kidney issues. Testing on mice does not really prove anything positive or negative to me, however, this may have negative health results in dogs. Testing on mice and certain other animals cannot take into account lifestyle or genetics. Use of this additive along with others, to me, is a backdoor approach to animal testing and there is no way to know how much the manufacturer is using in their dog food unlike human foods that are regulated. Studies have found that the tiniest amounts that are used in some spice mixes and other foods are not the least bit harmful to humans. "Silicon dioxide is critical for the development of strong nail, bones, teeth and hair. Research indicates that a lack of this mineral may lead to arthritis, poor bone formation, unhealthy skin and poor tooth development. Silicon dioxide also counteracts the effects of aluminum in the body, which may help prevent Alzheimer's disease." I like this additive for obvious reasons. If you want it a little hot, I use cayenne pepper or Kashmiri chili powder. Both are really hot but the Kashmiri chili has a wonderful flavor. If you use too much chili, you can always add some cane sugar or agave syrup to tone down the "hotness". Of course, try to buy organic spices to mitigate additives. Our Mexican family traditions require cooking the roast with no seasoning and adding pico de gallo to the finished roast along with steamed (microwaved) corn tortillas. The above spices are what I use for making our homemade enchilada sauce, albondigas soup, and Mexican rice not for roasted meat. These spices can be used, however, as a great "taco seasoning" although this is not traditional for Mexican cooking where we are from. Is salsa verde different from the usual salsa we enjoy with tortilla chips? Lisa - Thanks for the opportunity to share one of my recipes with your readers! I very much appreciate it. I_Fortuna - Making your own taco seasoning is a great way to avoid unnecessary additives. Fortunately there are also several brands of natural and organic taco seasoning mixes available in most well stocked markets for those who don't want to make their own. Marlene - Salsa verde is green instead of red because it is made with tomatillos instead of tomatoes. But this recipe will work with whatever salsa you like best. I swear I can smell it from the screen. My mouth is watering. @I_Fortuna, I totally get it. I lived in very very rural northern Wisconsin for over 5 years. The closest Walmart was more than 50 miles away. Gathering our supplies took a lot of time and energy but we never locked our doors and left the keys in our cars!! Well this looks yummy too. I wish I saw this for my holiday party, but I'm already bringing crab dip. Autumn Calabrese (21 day fix) has a really good South western seasoning. I live in San Diego, so I know exactly what I_Fortuna is talking about.